Weight: Brute I/II 24 lbs. The Polytone amps has been introduced in 1968. They are still popular among double bass players, but also jazz guitar players often play Polytone amps. The Mini-Brute III is provided with a 15″, the Mini-Brute I with a 12″ speaker. 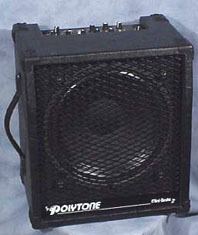 The Polytone Mini Brute III was my first double bass amp. It was still a a quite popular among bassplayers at this time (early 1990ies), but wasn’t able to get a really good sound out of this amp. So I soon replaced it by a G-K.